Win Free Ticket to Koga Top 10 Mics Concert!!!!!!!! 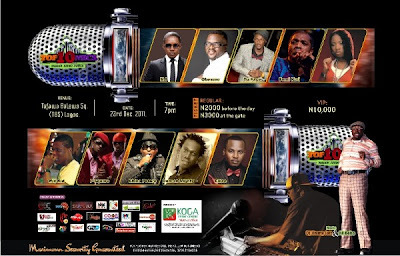 Dear OloriSupergal Readers, The countdown to Koga Top10 Mic Concert has begun, for next Five days we will have Five winners to win a free ticket to Koga Top 10 Mic Concert on December 23rd, 2011 at Tafawa Balewa Square, Lagos. Here is Question Number One – Name Three (3) places where Koga Top 10 Mics tickets are selling. Drop your Correct answer in the comment box – Your name, Email Address and Phone number so we can contact you to get your ticket. Goodluck! Follow @koga_top10mics on Twitter for more updates about the event.